New World Tortilla is consistently good at taking care of gluten-free me. I usually eat at their Davis Center (UVM) location, so they are able to control cross-contamination pretty well (I believe they make their own tortillas at the Pine Street location). I’m allergic to rice as well as gluten but I love dairy! 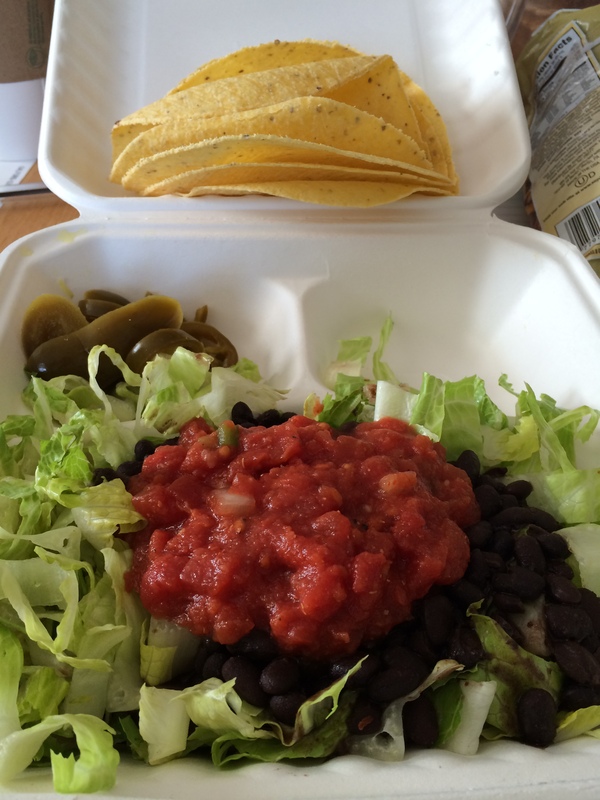 Today’s order (my regular, Chicken Vera Cruz as a salad bowl) was an epic fail on their part. Normally grilled chicken is served over a bed of lettuce with salsa and sides of jalapenos and sour cream. They grill a few corn tortillas with a little cheddar cheese. Well, check out what I got today (of course I didn’t check my order until I’d walked back to my office): No chicken, no sour cream and no cheese (just cold, plain tortillas). Wow, thanks NWT… what a bummer of a lunch. At least its a nice picture. Certainly not worth the $9.27 I paid. This entry was posted in Vermont restuarants and tagged grilled chicken, New World Tortilla on April 1, 2014 by gfvermont.